Can you feel it? That energy in the air, that tingle running down your spine? That's right, it's almost September, which means that it's time to step into the ring with the 31 Day Challenge! 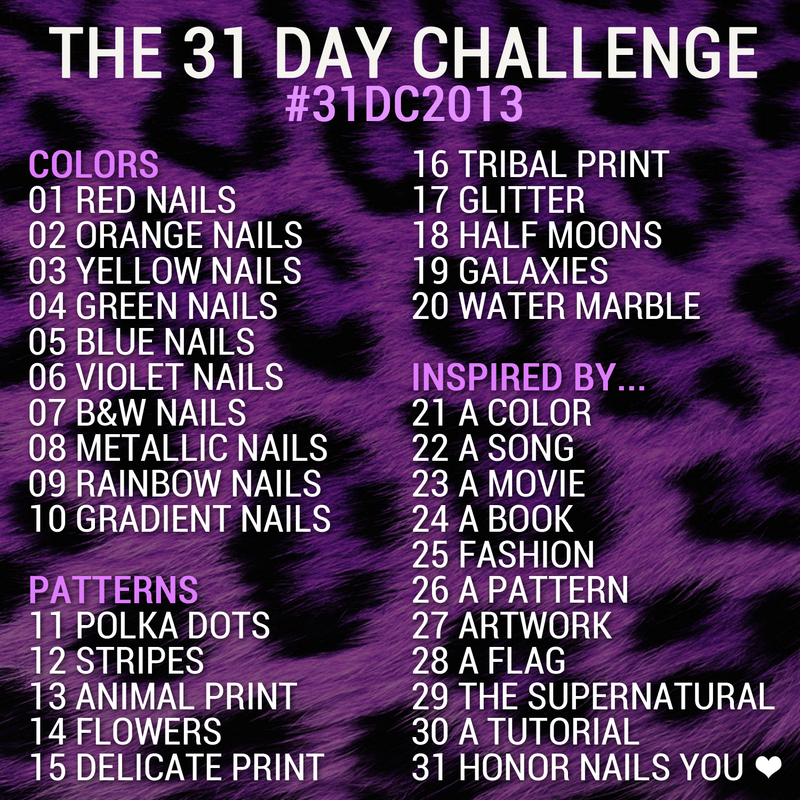 For those of you who may not be familiar with it, the Challenge involves producing nail art based on different themes every day for 31 days. Of course, it doesn't have to be in September, but I like to keep things consistent! 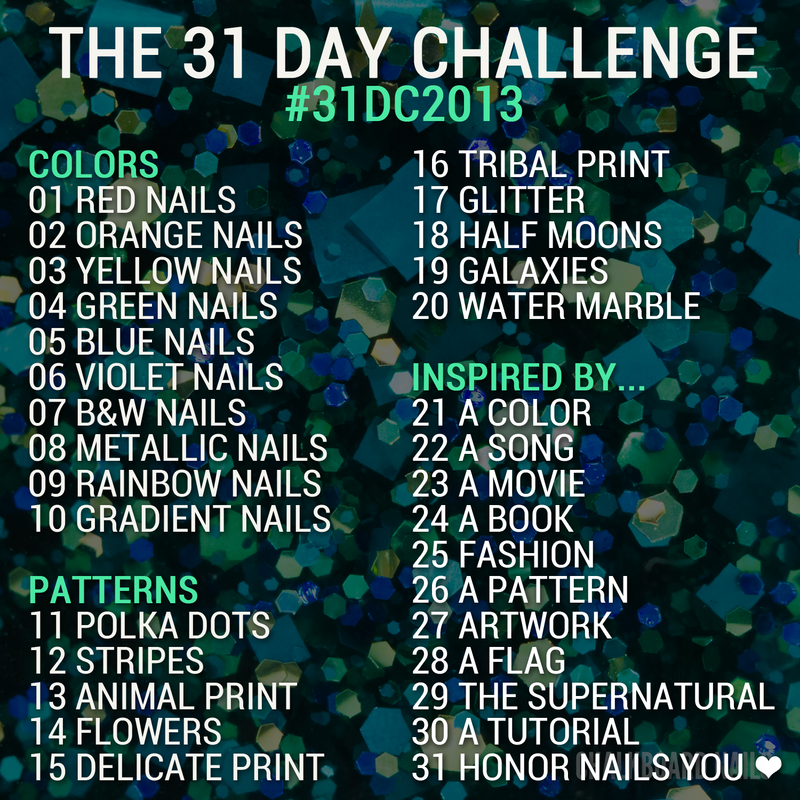 This is the third year that I've done the 31 Day Challenge, and the past two years have really helped me push myself and improve my nail art skills (see: 31DC2012 and 31DC2011). Of course, all of you are invited to participate as well! I'm gonna need some support here, people! For me, doing them consecutively is a big part of the challenge, but if you don't think you can do one manicure per day, feel free to space the prompts out. I've made some new images (square for you Instagram artists) to celebrate the occasion, including a hashtag that we can all use to check out each other's artwork. If you're not feelin' these ones, check out last year's images. Don't forget to click to enlarge! Get ready for a crazy ride -- day one begins on September 1st. I would really like to try this out. I'm fairly certain I won't be able to do one design a day, but I'd still like to participate! 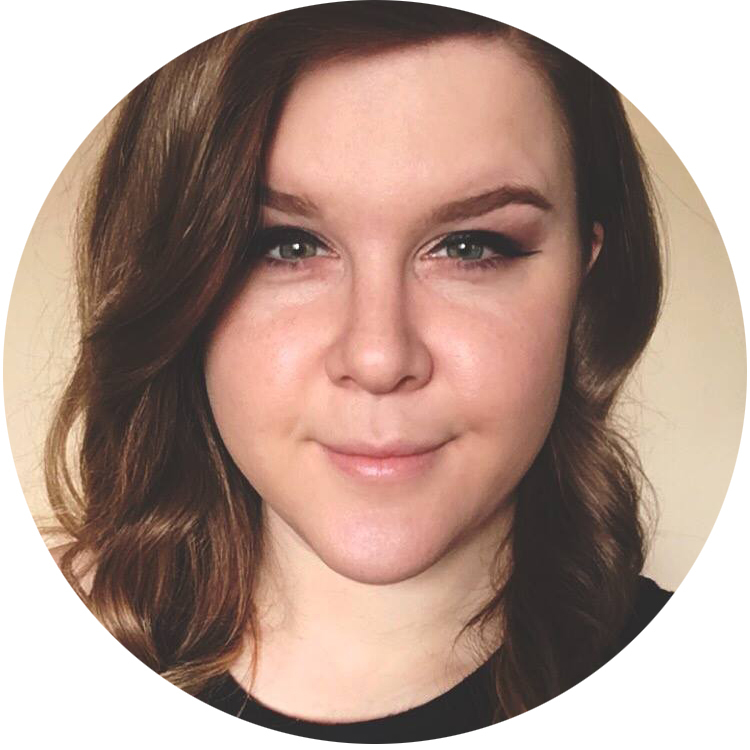 I did the Challenge on my blog last September, without realizing that you'd be doing it again at the same time, as well as a bunch of other bloggers, and it was so fun to see what everyone did! I will be doing it for the second time this September, along with Stephanie from Sincerely Stephanie! Can't wait to see what you come up with! 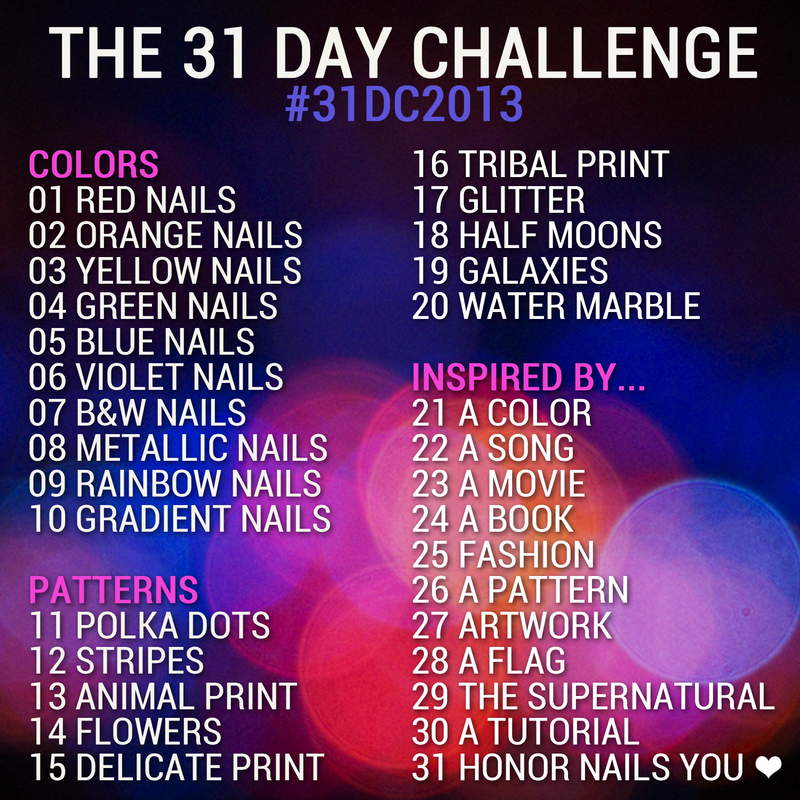 I'm doing a personalized 31DC starting Sept. 1 with a few other bloggers. I switched up a few things to challenge myself a bit more with new techniques. This will be fun to see what everyone is posting! I am so excited to be joining you in this challenge! I can't wait to test my skills, lol! Bring it! I'm so nervous and so excited to try this for the first time! I know this will really push me to get better. Good idea! I'm so excited to try this challenge on my blog. Can I use 1 of this pic to banner on my blog? Yes of course! Grab any of the images you like! There are no rules, you can choose to do the challenge daily or at your own pace! I will be posting my manicures everywhere (here, FB, Twitter, Tumblr, Pinterest, IG), and you should feel free to post wherever you want as well. No Instagram required! Ok thanks!!! I think I'm in! I have been a little stuck on what to do lately. I will definitely be joining it! mmmm, I´m so excited, I want to participate but what with my another posts? :-D Have I post every day or not? I just started this the other day. I might have to break out the falsies so I don't end up with nubs instead of fingers. 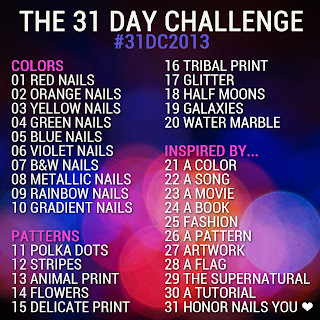 Never done a 31 day challenge and this looks like fun. I stopped at dots. I'm starting over again because I didn't like some of my designs. this looks great! I really wanted to do this challenge for a ling time but It's to intense for me! I will probably start this at my own pace soon! I can't wait to see your design! good luck! I'm going to do my best to get this done! Hopefully I'll be able to pull out all 31 manicures in a row! I would love to try to do this...been looking to try out a challenge. Don't know if I will get the time to do them all but gonna try my best...How do we submit our photos to you? Never done a challenge before. Your past 31DC manis have been so inspirational, I definitely want to attempt this. I too will probably do multiple posts a day to keep up with reviews, but the more nails the better, right? 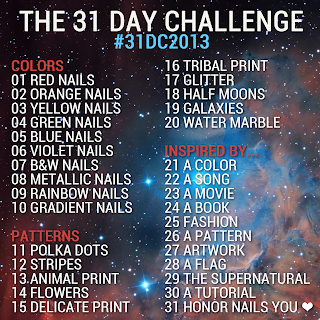 I might even set up an In-links for each day of the 31DC so everyone can share their manis. I think I'll grab that galaxy design banner to put up on my blog. Thanks Sarah!! Gosh, I still haven't finished my 31 day challenge from last year. Whoops! Just painted my nails for Day 26 (or, more specifically, day 358) after seeing this post and I'm determined to finish it before the end of September this year! Can't wait to see what you come up with this year. Hi, I'm only new to nail art blogs and I'm confused. Why is it the 31 day challenge when September has only 30 days? Ok I am going to give this a try as well. I have never done anything like this and not sure I will be able to keep up but I'm sure it will be fun trying lol! I feel the same as Dee. I see a lot of mis-matched hands and late nights in my future! Eek! Also is the hashtag to use set? I might have missed it. It's not really a submission kind of thing -- you would just post it on your own blog, FB, Twitter, Instagram, whatever. It's a personal challenge for each individual and you can choose to run it however you'd like! 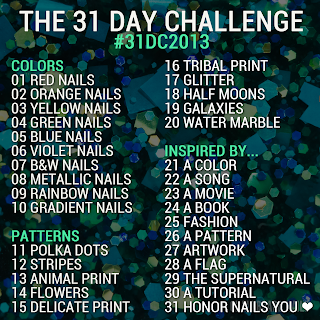 Just be sure to use the hashtag #31dc2013 if you are posting your manicures on social media! Yay, so glad you're participating! I thought about doing an Inlinkz but thought it might get out of control -- I was hoping the hashtag would sort of work in its place. More power to you though!! Im doing the challenge this month but my laptops cut out on me so its on hold at the minute :( cant wait to see your designs though! This will be my first time doing this. I hope my cuticles hold up! Oh, had I known... 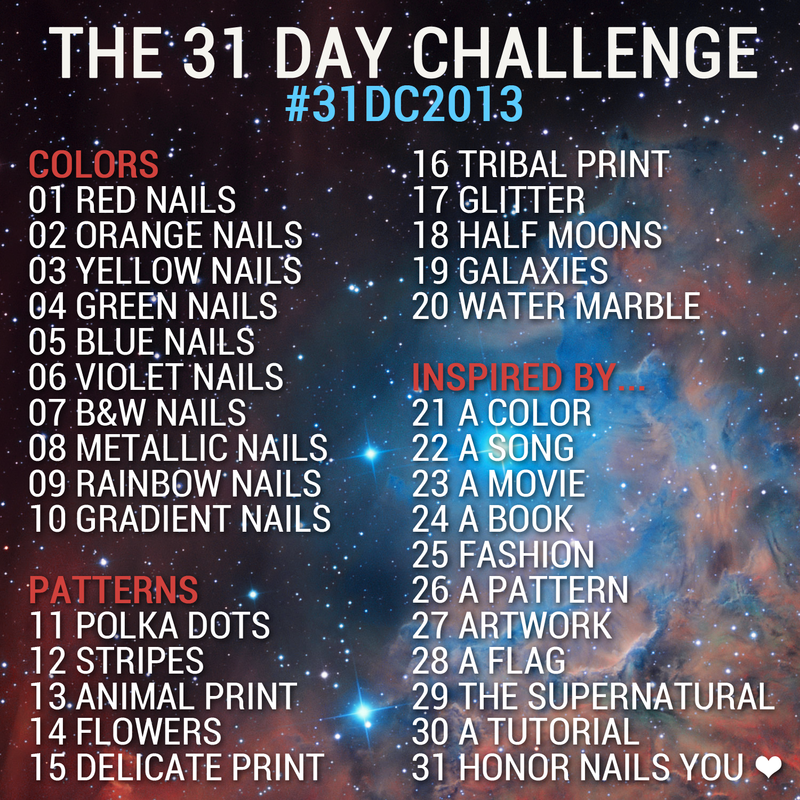 I stumbled upon the 31 Days nail challenge two month back and though: lets give it a try and worked along exactly those Challenges. Today is my third last day. Wish you all luck with yours next months and I'm already curious on what you did. I can't wait to see your third round! I'm not going to be finished with the Alphabet Challenge by the 1st or I'd start with you. Next year I will synchronise it! I've always wanted to try this out, never could find the time. So what should I do? Make the time, of course! I'm gonna do it! I'm so excited to finally do this, I can't wait! I think I'm going to give it a try as well - my first challenge, yay! Ok. I'm going to bite the bullet and start my own blog with this challenge. Fingers crossed. Nad how goes with blogs? I would like to try this challange, but I would like to submit my photos with you, and have little pictures of other participiants on the end of my post. I saw that on some blogs, but I have no idea how to do it. I will for sure be participating! morenailpolish.blogspot.com is running some Inlinkz codes for the challenge, you can find details at the end of her 31DC post on her blog. I'm in at the last minute! Hi Paulina! There are no real rules, so you can feel free to interpret the prompts however you want. I'm already right in the 31 day challenge though nowhere near to posting each day. But as I use different means to express each given task, I kinda have an excuse :) Blue is up right now at my blog! Thanks. I'm set up at http://nailsonthebeach.blogspot.com.au/. Fingers crossed. I think it means "Honor Nails you love". So if there's a particular mani that someone else has done that you really really like, you re-do it yourself. Yes, sorry I missed this comment! Filed and Styled is correct on what it means. 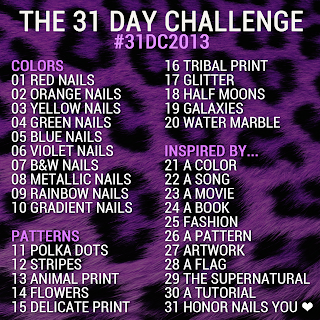 Feel free to start it whenever you want, I will be doing day 31 on October 1st.